As quoted by Give BookDepository.com, "Givea person a crème brûlée and you feed them for a day. 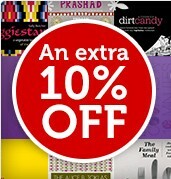 Give them an extra 10% off the best cookbooks ever and you'll all eat happily ever after." It's indeed a good idea for yourself to pickup some great recipe idea as well.